I know I’m not very good at Rocket League. I don’t need this pointed out to me, but the video above makes it abundantly clear. MLG held an open Rocket League tournament with a $500 prize pool yesterday—a meager purse compared to the likes of Dota 2’s The International or League of Legends’ upcoming LCS finals, but that doesn’t mean the level of play was low. 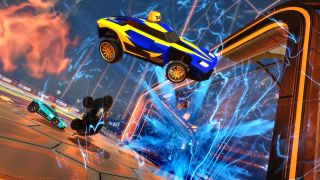 Rocket League is a relatively new game but, thanks to Supersonic Acrobatic Rocket-Powered Battle-Cars (its poorly named first iteration), many of the competitive players have been already been playing for a very long time. Meaning they can already pull off the incredible moves you see above. The grand finals of the tournament saw the undefeated team Cosmic Aftershock—led by the already well-known player Kronovi—up against team Kings of Urban in a best of three. The first two games of that match are incredibly impressive and definitely worth watching, but the video above starts at the opening on game three, which is probably the most incredible game of Rocket League I’ve ever seen. I don’t want to spoil anything, so I’ll just say it had me jumping out of my seat, and is probably the way every event organizer dreams the last game of a tournament will play out. As an esport, Rocket League is clearly still young. The new spectator mode makes tournaments like this much easier to view, but there are still some kinks to work out. That being said, it’s already thrilling to watch and has lots of room to grow, with Psyonix President Dave Hagewood telling us they “want to do everything we can to support [Rocket League] becoming an esport,” in an interview earlier this month. The short matches and easy to understand mechanics—compared to the enigma that is a MOBA to those unfamiliar with them—give Rocket League a real shot at being a top competitor in the esports world, and the match above proves that. For more amazing Rocket League moments, we do a roundup of the best Rocket League plays of the week every Tuesday.